Nearly 40 songs and more than 2 ½ hours of music. 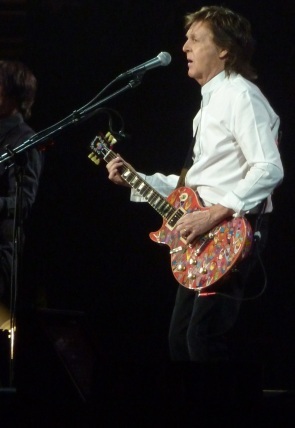 That was Paul McCartney who played to a massive, capacity crowd on Friday for his One on One tour at the Moda Center in Portland, OR. There’s little need to critique the performance because it was Paul McCartney. 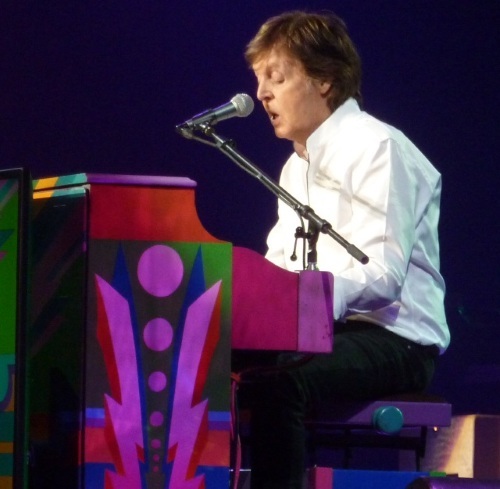 But here’s the thing – the former Beatle played flawlessly. He pulled out hits and dove into deep album material in a catalog of songs stretching back 50 years. Of course he played songs by his most famous band. Fans of Wings went home happy and those who follow his solo work were likely thrilled. If you’re in all three camps then it turned into a legendary evening. McCartney seemed genuinely moved by the audience turnout and early in the show took a moment to, as he said, “drink it all in.” What a second…that’s what we were doing. An icon of icons and in many respects a living historical figure still doing what he does best. Performing his music. McCartney and his band, consisting of (co-founder of Ednaswap) Rusty Anderson and Brian Ray on guitar, percussionist Abe Laboriel, Jr. and Paul Wickens on keyboards, started the evening with the popular Beatles song “A Hard Day’s Night,” then “Save Us” off his latest solo effort New from 2013, the uber favorite “Can’t Buy Me Love,” the rocking Wings song “Letting Go” and the very catchy, and somewhat amusing “Temporary Secretary” from the 1980 solo release McCartney II. 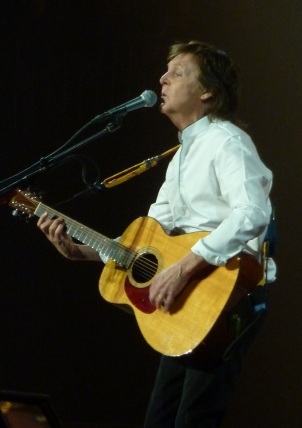 The evening followed a similar format intertwining mostly Beatles songs with cuts from Wings and others from his solo albums, including three off New. He followed the slow and bluesy Wings song “Let Me Roll It” by paying homage to Jimi Hendrix playing an outtake of “Foxy Lady” before diving in to the Beatles’ “I’ve Got a Feeling.” His current wife Nancy Shevell was in the house who he dedicated “My Valentine” from his 2012 release Kisses on the Bottom. 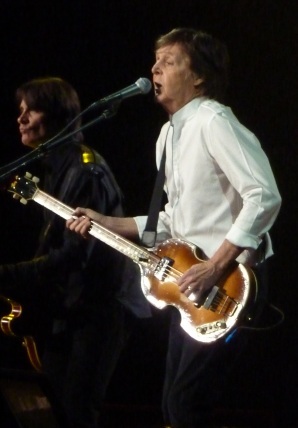 McCartney was never without an instrument in-hand whether it was his bass guitar, electric guitar, acoustic guitar, a piano, of which there were two, or a ukulele, one given to him by George Harrison and used during “Something” which he dedicated to his old band mate. He didn’t forget John Lennon either, toasting to him before playing the emotional “Here Today” a love song of sorts written for Lennon and released on the 1982 album Tug of War. You could hear the loss, still today, McCartney feels for his slain friend. Quarrymen. He wasn’t jumping from speakers or performing any high kicks but he walked freely around stage showing little if any signs of slowing down. Strategically placed computer screens displayed song lyrics which he used on occasion and his vocal range came across strong and only during “Here, There and Everywhere” did you get a hint of his age but then he followed that with “Maybe I’m Amazed” which he wrote for his first wife Linda, and absolutely crushed it. Yes, he played the awesome “Eleanor Rigby,” he pulled out “Ob-La-Di, Ob-La-Da” and after “Back in the U.S.S.R” he told the story of how he was the first rock band to play on Red Square, which happened in 2004, and the Russian Defense Secretary upon meeting McCartney said the first album he ever bought was “Love Me Do.” Funny because it was the Russian Defense Secretary or because “Love Me Do” isn’t actually an album? It didn’t matter. It was funny. And McCartney charmed all evening. In fact, nearly three hours of just storytelling would have sold out the place. The Wings material allowed him to, well, spread his wings so to speak. A bit more octane then the Beatles era, lots more guitar using heavier beats like “Band on the Run” and he dazzled on the piano for “Nineteen Hundred and Eight-Five.” But nothing came close to the James Bond classic “Live and Let Die” that exploded on stage, literally too, as a sudden boom on one of the down beats ignited a dozen or so fountains of flames across the front and behind the stage leaving anyone in the first few rows with a mild tan. 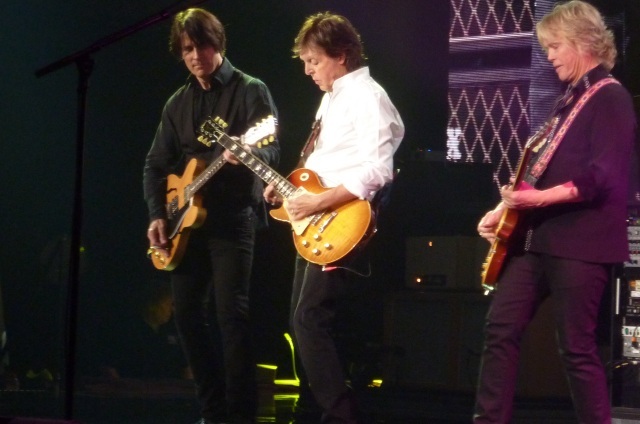 McCartney’s music doesn’t typically give blistering guitar solos, open throttle drum fills or head-banging rhythms. Not overly complex, sometimes simple but damn if they’re not catchy. And he certainly doesn’t fit today’s popular mold which seems to change yearly. But unless you’ve been living in a cave for the last six decades it’s pretty hard to escape hearing the Beatles and McCartney songs because classic rock radio plays them, adult contemporary and oldies stations too, that one that plays everything, and sometimes even alternative rock when McCartney’s bands fit into whatever “theme” meshes within the current marketing promotion. You don’t even necessarily need to like his music though based on the demographics cheering him on at the Moda Center, his reach is far and wide. His influence cannot be denied. McCartney and his partners helped usher in the rock-and-roll era of the 1960s and music hasn’t been the same since. Great detail here. I do think Paul’s voice is getting a little wobbly on some tunes. I think he’s aged well, but at 73 you can’t expect him to sound like he did when he was 37.